Kotelnikov's name symbolises impressive period in development of communications, radio-engineering and radio-physics. His “Theory of Potential Noise Immunity” which provided mathematical facilities for synthesis of optimal signal processing systems in radio communication, radio-location, radio-navigation and many other fields, the theorem of sampling and processing (so-called “Kotelnikov-Shannon theorem”), creation of radio-telescopes and numerous fundamental researches in astronomy were among his most prominent achievements, which influenced the world science. During the World-War-II V.A. Kotelnikov was designing radio systems for single-band channel transmitting and also facilities for human speech encrypting, which were widely used in army. After the war he did much for the progress of radio-engineering and radio-physics. Besides impressive personal researching work he made notable contribution as scientific administrator – he established two very important scientific centres: Special Design Bureau at the Moscow Power Engineering Institute and the Institute of Electronics and Radio-Engineering at the USSR Academy of Sciences. As the vice-president of the Academy he actively participated in forming of the state scientific development policy and in organisation of large scale scientific researches. During many years V.A. Kotelnikov lectured at universities. He also initiated and successfully performed modernisation of radio-engineering education in the USSR . That was a comprehensive reform conducted in the 1960-s. V.A. Kotelnikov personally prepared several up-graded educational courses for technical universities. Vladimir Aleksandrovich Kotelnikov was born on the 6 th of September 1908 in Kasan (Kazan). His father Aleksander Petrovich Kotelnikov – famous scientist, mathematician and mechanist, was a professor of the Kazan University . Notably that his own father – the grandfather Petr I. Kotelnikov, also was a mathematician of the Kazan University. He was a colleague and friend of N.I. Lobachevsky. Connections with Lobachevsky made deep, may be even decisive, influence on professional life of his son. After graduation from secondary school in Moscow in 1925 V.A. Kotelnikov entered V.N. Podbelskiy College for Communications. A year later he passed entering exams to the Moscow Higher Technical School (MHTS – one of the oldest and best technical universities in Russia). In 1930 academician Karl Adolfovich Krug  formed special faculty of electrotechnic (electro-engineering) on MHTS basis, then separated it and developed into independent educational organisation. The faculty in its turn was basis for the following creation of the modern Moscow Power Engineering Institute (MPEI). Kotelnikov also joined it and, in 1931, graduated from its faculty of radio-engineering with diploma of engineer-electrician. With that diploma he received appointment at the Red Army Institute of Communication (now CSRII of the Defence Ministry). There he worked as an engineer under guidance of Prof. I.G. 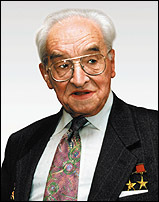 Klyatskin – talented scientist in radio-engineering, who also possessed outstanding organisational talents. In the same 1931 he began post-graduate course at the MPEI, preparing his dissertation work. As a post-graduate he was teaching basic courses of radio-engineering. In 1941 he was promoted to professor's assistant and received a position at the Central Scientific-Research Institute of Communications (CSRIC). His scientific work began already at student years. In 1928 Kotelnikov published his first article, “Triple Characterograph”, in journal “Telegraphing and Telephoning without Cables”. In 1932 he prepared report “About Conducting Ability of Wire and Ether” for a scientific conference. In the report he first formulated famous theorem of readings – a basic one for communication theory. It was published in 1933. In 1936 two more of his pioneer works appeared in the scientific periodical of the Electrotechnical Institute of Communications. In the first one, “Quantitative Evaluation of Various Methods of Struggle with Fading” he implemented probability theory in research on efficiency of the system with separated signal reception in a multi-ray channel. The other article, “Influence of the Sum of Sinusoidal Electric Tensions upon Non-linear Resistances”, presented general analytical research method of signals non-linear distortions in various devices. Beginning from the end of the 1940-s, similar methods were developed with the use of mathematical fundamentals of the stochastic processes theory. That was done by both the Soviet and foreign scientists: R.L. Stratonovich, V.I. Tikhonov, N. Wiener, S.O. Rais and others. In the 1930-s V.A. Kotelnikov initiated and headed designing of the single-band transmission devices for maintaining radio-communication line Moscow – Khabarovsk (the USSR Far East). It was produced and mounted at the “Oktyabrskiy” broadcasting centre in Moscow and put into operation in 1939. Famous Soviet experts A.V. Cherenkov and A.F. Ganin also took part in the work. Obvious importance and high scientific level of his researches and publications brought the first scientific degree “Candidate of Technical Sciences”, which he was awarded, without submitting dissertation thesis, in 1938. The messages transmitted through single-band communication line could be easily intercepted what was more that undesirable, especially in the field of military communications. Therefore Kotelnikov proposed design of special device coding human speech. As importance of it was clear, special laboratory for its realisation was established at the CSRIC in 1939. According to Kotelnikov's project, speech encrypting system should be based on quasi-stochastic transposition of the vocal signal time-fragments transmitted through a telephone channel. Now such technology is often referred to as “speech scrambling”. The transposition scheme should be –naturally- known only to the message recipient. Received signal was to be processed in a reverse way to restore the initial order of its time-fragments and the transmitted speech would be understandable again. In other countries such ideas equally emerged but for secrecy reasons their open discussing began much later, (e.g. : R.C. French. “Speech scrambling and synchronisation”. Philips Res. Rep., Supplement № 9, 1973). In 1941 V.A. Kotelnikov described theoretical principles of the stable system for signal encrypting. The system should be a digital one, and the converting of analogue signal into digital form should be based on the Kotelnikov theorem of sampling. His team also performed researches on possibilities of encrypting with implementation of the general principles of “vocoder”, described in 1939 by American engineer Homer Dudley of Bell Labs. H. Dudley himself began experimenting with a vocoder in 1928, and eventually patented it in 1935. Dudley 's vocoder was used in the SIGSALY system, which was built by engineers of the Bell Laboratories (Alan Turing also took part in the work) in 1943. The SIGSALY system was used for encrypted governmental and other high-priority communications during the war. Later American researches in this field have been continued by James Flanagan. As the work on the encoding system had big military importance, the laboratory was evacuated from Moscow to town Ufa (West Urals) for the war period. There it joined a group of specialists from Leningrad who were conducting similar researches. The device (probably it mightd be caled “Kotelnikov's vocoder”) was ready by the autumn of 1942. During the war Kotelnikov's encoders were widely used by the army. They were also used for governmental communications, e.g. for direct consultations with Moscow during adopting the German capitulation act in Berlin in May 1945. Contribution of Kotelnikov and his team was awarded several “State Premium ot the Grade I” (then it was named “Stalin Premium”) in 1943 and 1946. In 1944 he resumed lecturing at the MPEI and in 1946 was appointed the dean of its radio-engineering faculty. Kotelnikov not only proved to be a good teacher but also demonstrated outstanding organising talents. He formed a group of brilliant scientists as the faculty staff; they all were also excellent at pedagogic. Thus the chair of radio-location was headed by academician Y.B. Kobzarev, chair of radio-receiving equipment was held by academician V.I. Siforov, chair of radio-transmitters by Prof. S.I. Evtyainov, chair of antennas by Prof. G.Z. Aizenberg (Eisenberg), Prof. V.B. Pestryakov ran course of radio-navigation, etc. All of them were famous for their notable scientific contribution to radio and electronic engineering. That was how one of the USSR best schools of radio and electronics was created. Most of the Soviet younger computer pioneers of the post-war time graduated from this faculty. Among them were  N.Y. Matyukhin, N.P. Brusentsov, M.A. Kartsev, V.S. Burtsev, V.K. Levin, V.A. Melnikov, T.M. Alexandridi and many others. As a teacher Kotelnikov always insisted that radio-engineering had nothing really difficult and himself was admired by students and colleagues for the rare ability of explaining the most complicated things in the most simple and clear way. His collaborator Prof. L.I. Filippov remembered that, “Everybody could approach him with every possible question. He could equally willingly and respectfully discuss both theoretical fundamentals of –say- new radio-telescope and some small electric circuit in a student's course-project, if it was important for the interlocutor. He always managed to make an impression at the asking one that he understands everything himself. Many foreign scientists, who had had a chance to personally know Kotelnikov often mentioned him as an example of brilliant scholar, both theoretician and a practical one”. In December 1946 Kotelnikov submitted thesis of his doctoral dissertation titled, “Theory of Potential Noise Immunity”. It was officially adopted by the MPEI Scientific Council in January 1947, and soon after he was awarded a doctorate. That classical research became a great contribution to fundamentals of the contemporary communication theory, what eventually brought its author the world fame. Besides lecturing V.A. Kotelnikov founded at the MPEI one of the biggest scientific centres Special Design Bureau, which conducted researches and designed numerous multi-channel radio-telemetric systems for ballistic rockets and spaceships. Also the world first television system for space communications was created in that centre. Kotelnikov's systems of active radio-location and radio-locators for side scanning, in complex with synthesised instrumentation were mounted on space probe-ships “Venera” (Venus). They were used in making radio maps of the Northern hemisphere of Venus. In 1967, a new system for television communications, named “Orbit - Lightning” (Russ. “Orbita - Molniya”) was put into regular operation. It extended range of the central TV broadcasting from European part of the USSR to Siberia and the Far East via TV transmission satellite. The project was jointly performed by Kotelnikov's centre and Scientific Research Institute of Radio-Communications. In the beginning of the 1950-s intensive development of radio-engineering, extension of the broadcasting frequency diapasons and appearance of such new domains (during the war period) as radio-location, radio-navigation, ultra-high frequency devices (UHF), etc. caused need in up-grading of education system which was preparing specialists for those fields. V.A. Kotelnikov quickly worked out new educational programs and composed courses which, largely due to his personal energy and insistence, were introduced into university curriculum. They incorporated the latest scientific achievements of that time, such as engineering of pulse devices, radio-control, radiolocation and new systems of message transmission. V.A. Kotelnikov and A.M. Nikolaev – a lecturer of his faculty, elaborated new course “Fundamentals of Radio-engineering”. Lectures of that course became basis for the brilliantly written book, issued in two volumes. The first of them was printed in 1950 and the second one appeared in 1954. The book was very popular among several generations of students. Lectures on new subject “Electro-dynamics”, aimed at UHF technologies, he had written entirely by himself, although he was always very busy. They were equally popular among students and teachers. V.A. Kotelnikov headed the radio faculty at the MPEI until 1953, when he was elected to the Academy. Then he resigned from the administrative position but continued lecturing at the institute. In 1968 he established, and held for a long time, a chair of radio-engineering at the Moscow Institute of Physics and Engineering. In 1953 academician A.I. Berg, himself founder of the Soviet radio-location and leading expert in – military-electronics, initiated establishing of new academic research institute of radio-engineering and electronics (IRE AS USSR). As the initiative was actively supported by V.I. Kotelnikov and number of other academicians the institute was opened within a short time. A.I. Berg became its director, however, with his, soon following, appointment as the USSR vice-minister of defence he passed that position to V.A. Kotelnikov. It happened in 1954. The latter again demonstrated his talents of true scientific and administrative leader. No wonder that within the last half century the institute (IRE) grew into the USSR/Russia's largest and most important research centre in this field. The institute researches were literally booming. Kotelnikov managed to form so good scientific team that it really deserves some special words. Thus academician B.A. Vvedenskiy and professors A.G. Arenberg, L.A. Zhekulin and A.N. Kazantsev headed departments of electrodynamics, theory of antennae and radio-waves transmission on various frequencies. Professors E.N. Bazarov and M.E. Zhabotinskiy dealt with quantum physics, academician Y.B. Kobzarev and professor V.I. Bunimovich developed methods of weak signals detection within noises and measuring of statistic characteristics of stochastic tensions. They also made researches on statistic radio-engineering. Academician V.I. Siforov was working on radio-relay communication systems and theory of information, academician V.V. Migulin, professors G.S. Gorelik, M.A. Kolosov, S.G. Kalashnikov and some other prominent scholars ran monitoring of current scientific and technical general development and defined new fields of priority for future researches. Academician A.A. Pistolkors headed researches on aerial-engineering and creation of ferrite parametric amplifiers for ultra-high frequencies, academician Y.V. Gulyaev developed linear and non-linear electronic acoustic devices for signal processing. Professor N.A. Armand created radio-location systems for remote probing of the atmosphere and the earth surface and V.A. Kotelnikov himself worked on radio-location systems for space researches and for planetary radio-location. Jointly with academicians Y.V. Gulyaev (later director of IRE) and N.D. Devyatkov V.A. Kotelnikov paid much attention also to theory of such subjects as microelectronics, optic-electronics, superconductivity in electronics, semiconductor electronics, also of acoustic and magnetic electronics. Fundamental researches were also conducted on optic fibre communication systems, radio-physical research methods for natural resources of the Earth, medical applications of electronics and automation of scientific researches. V.A. Kotelnikov also performed radiolocation investigations of solar system and of the space in general. Those were large-scale researches. For their facilitation he engaged numerous industrial enterprises and design centres, and finally constructed very complicated complex of various radio-installations and instrumentation. It included powerful radio-transmitters, aerials with high precession aiming, ultra-sensitive receivers and complicated system for automatic processing of received signals. Using that complex he and his colleagues made several important discoveries in 1961, 1962 and 1964. Thus it enabled astronomical radiolocation measuring with unbelievable, for that time, precession. It reached 10 power (-8) of the measured magnitude. As a result, the astronomic constant – distance between the Sun and the Earth – was proved. That, in its turn, made possible efficient proving of the whole Solar system dimensions. It also permitted better understanding of the lows of space mechanics (motion of space bodies) and provided necessary precision of the space-ships flight control. Their team was the first to perform radio-location of the Venus (1961-1964) and to compose Atlas of its surface, which was published under Kotelnikov's editing. They also conducted radio-location explorations of the surfaces of Mercury (1962), Jupiter (1963) and Mars (1963). In 1964 those researches were awarded the “Lenin Premium”. In parallel with fundamental space researches V.A. Kotelnikov ran other projects. In 1959 he founded laboratory of parametric amplifiers where theoretical researches were made on practical ways of engineering design of devices with extreme characteristics of noise and frequency bands. In 1984-1992 V.A. Kotelnikov examined precession of the relativity theory of the planetary motion. In the same period, in 1987 when he was almost eighty, he quit his administrative activity, however remained at the IRE as the honorary director and acting chairman of its scientific council. He also remained at the Academy's department of space research and continued work as the Academy's consultant. In comparison with other scientists of his level V.A. Kotelnikov has published not so many books or other written works. Before 1961 those were about 25, including the book “Theory of Potential Noise Immunity” and the university text-book “Fundamentals of Radio-engineering” in two volumes. One more important publication of that period was an article called “Signals with Maximal and Minimal Probabilities of Detection” (1959). In 1961-1983, that's the period of intensive space researches, he published about 50 works on radio, electronics and space engineering including description of the researches on Mars, Venus and Mercury. In several articles he attempted to analyse problems of establishing, theoretically possible, contacts with some extraterrestrial civilisations. In 1964 he received a patent (reg. No. 163215) for a “Device for Generating Signals with Step-Saw Frequency Modulation form”, which was implemented in the planetary locator created at the IRE. Having left his directorial position at the IRE Kotelnikov resumed work on theory of signals and methods of their processing. His two new publications “Signals with Minimal Energy of Dangerous Spectrum” and “Impulses with Minimal Energy in the Spectrum Outside the Specified Frequency Band”, appeared again in the journal “Radio-engineering and Electronics” (№ 7, 1996 and № 4, 1997). They displayed research problems of synthesising signals with minimised energy outside the boarders of their intended frequency band. The publications were his reaction on the problem of “overcrowded ether” which had been getting more and more urgent. Solving of the problem needs technologies that provide possibilities to transmit maximal number of broadcasts (signals) through relatively narrow band without their mutual distortion. Scientific achievements of V.A. Kotelnikov have been prized with numerous Soviet and international signs of honour. Thus he was twice awarded the honourable title “Hero of the Socialist Labour” , decorated with six “Lenin Orders”, with order “October Revolution”, two orders “Red Banner of Labour” and order “Sign of Honour”. He was also given a “Lenin Premium” and two times the “State Premium”. In 1964, the Institute of Electrical and Electronics Engineers, Inc. (IEEE) awarded him the medal, “For outstanding contribution to development of the theory and practice of radio-communications, for fundamental researches and the works on the radio-location in astronomy”. Presidium of the AS USSR awarded him several times. In 1974 that was the “A.S. Popov Gold Medal” for, “His creative contribution to fundamental researches on the communication theory and planetary radiolocation”, in 1981 the “M.V. Lomonosov Gold Medal” (the Academy's highest award) for, “Outstanding achievements in radio-physics, electronics and radio-engineering” and in 1987 the “M.V. Keldysh Gold Medal”. In 1999 V.A. Kotelnikov was given a prestigious international award – premium of the Eduard Rhein foundation (Germany). That was the prize for his rigorous proving of the famous “Sample Theorem”. In 2000 he was decorated with the IEEE “Alexander Graham Bell Gold Medal” for outstanding contribution to the theory of communications and also with honourable IEEE – “Millennium Medal 2000” . President of the IEEE Prof. B Eisenstein characterized him as, “Outstanding hero of our time. Giant of engineering thought, who made most prominent contribution to development of radio-communications”. Together with some colleagues V.A. Kotelnikov founded the All-Russia scientific society of radio-engineering, electronics and electrical systems for communications, named after A.S. Popov, and was its chairman during many years. He was also honourable member of the IEEE, member of International Scientific Radio Union –URSI, and member of Polish, Czechoslovak, German, Bulgarian and Mongolian Academies of sciences. He was also elected to the International Academy of Astronautics. Czechoslovak Academy of Sciences decorated him with the Gold Medal “For Scientific and Humanitarian Merits” and with “Fr. Krzyzek Gold Medal”. Academy of Slovakia awarded him Gold medal “For Scientific Merits”, Society of Polish electricians – the “Proff. Jan Gorshkovski Medal”, the COSPAR – “Vikram Sarabhai Medal”. He also received international “Jawaharlal Nehru Premium” and many others. Being the AS USSR vice-president in 1969-1988, Kotelnikov greatly influenced the government policy in the field of scientific development. His colleagues from the Academy often joked that the post-war physics was developing under the sign of “four K-s” – Keldysh, Kurchatov, Korolev and Kotelnikov. He personally initiated and organised performance of many large-scale projects that integrated big research teams and produced numerous results and practical applications. Many years he headed the AS USSR scientific council on “Radio-astronomy” and the council on international co-operation in exploration and usage of the space. He was a chairman of the Scientific Council (at the AS USSR Presidium and the USSR State Committee on science and industry) on problems of scientific, engineering, economic and social outlook and member of the USSR Council of Ministers' committee on state premiums. Also many years he was chief editor of the journal “Radio-engineering and Electronics” and editor of other leading periodicals concerned with problems of radio. Already the sages of the ancient emphasised “scientific curiosity” as the important feature of every real scientist. That was fully proved by whole Kotelnikov's life, since it was one of his most typical characteristics and also one of the basic stimuli for his activity, which eventually produced outstanding scientific results. Often it happens so that professional, intellectual and moral qualities of a person are far from being in a good balance. Luckily Kotelnikov didn't belong to that category; one could even say that he was a man of internal harmony. Professor A.L. Zinovyev – one of his former students, the dean of the department of radio at the MPEI after Kotelnikov's election to the academy, remembered that Kotelnikov was very open man always ready for communication. “It was very easy to find common language with him provided the subject of the talk was interesting, and Kotelnikov's interests were really vast”. The only thing he couldn't accept was rudeness. All what he was interested in, he studied in details. Thus in the beginning of the 1950 he took to the amateur film-making. For that reason he studied all available equipment, mastered technologies of film development and cutting, and introduced many innovations himself. In the 1960-s, Kotelnikov with his colleagues from the MPEI purchased new yachts. He immediately made some changing in their design. As he was also devoted auto driver, auto-traveller and hobby master he always suggested some improvements in all cars he had. In spite of the age he was fit until almost the last days of his life and loved to go skiing in winter. His family life also was lucky. His wife Anna I. Kotelnikova many years was a lecturer at the Moscow Electrotechnical Institute of Communications. His son Alexander (1940-2000) graduated from this institute and remained there as a scientist. The daughters Natalya (born 1942) and Marina (born 1956) graduated from faculties of physics and chemistry of the Moscow State University and are working at institutes of the Russian Academy of Sciences. The family also has got seven grandchildren. The people with higher intellectual abilities can feel beauty or aesthetics of ideas and theories. Usually a scientist searches for the truth and the aesthetic perfection of a theory can be a sign of its veritableness. Of course that was known already in the old time. For example Galileo Galilei used to say, “Truth and beauty are the same things”. More modern person - A. Einstein suggested that, “inner perfection and outer justification” of a scientific theory are the best criteria of its truthfulness. Taken alone, the latter of his two conditions would be rather utilitarian, being focused more on the applied (or even consumer) aspect, therefore it would not be sufficient for evaluation the theory itself. At the same time, the “aesthetic perfection” of its scientific fundamentals (inner perfection) provides reasonable argument for its being the basis of both theoretical and applied further development. However, in reality there are rather few high level experts who combine outstanding intuition with “understanding of beauty” (at least in their professional field) and who can draw practical conclusions from that feeling of theoretical perfection. Returning to Kotelnikov's theory of potential noise immunity, it did possess all necessary “inner perfection” from the very beginning. However its “outer justification” came much later, after years of intensive large-scale professional labour. The theory was eventually implemented in solution of the great number of practical problems. Therefore, one might say that “it received its outer justification too”. V.A. Kotelnikov has been a hard worker, but he did not only make “things”. All life long he kept on generating ideas, which were giving birth to other ideas and finally were being implemented in great many fields. With his work he made enormous contribution to the progress of communication technologies and systems as well as to forming of the whole Global Information Society. 2. The Sampling Theorem – An Essential Element of Digital Communications Technology . The sampling theorem was first formulated by V.A. Kotelnikov in a mathematically exact manner and published within the context of communication technology problems in 1933, when he was only 25. According to the theorem every random function with spectrum limited by frequency F, could be represented with array of its samples regularly retrieved at the time intervals 2F. In other words the theorem states that the signal can be retrieved from the sampling values without error provided the number of samples is at least twice as big as maximal frequency of the initial (analogue) signal. For example, the sampling is basic process in replacement of the “analogue” long-playing record by the “digital” compact disc (CD). Noise immunity and fidelity benefit tremendously because the sound signal is no longer stored as a delicate engraving of record grooves, which are quickly eroded under intensive usage, but as a much more robust sequence of numbers. This numerical sequence is obtained by sampling the sound signal amplitude at regular and very short intervals. Thus the usual frequency for a CD reaches 44,000 samplings a second. The obtained sampling values are stored in the CD as a rounded-off binary numerical sequence, in other words as “bits”. Although, as can be seen even from this popular example, the theorem has great significance for the modern digital communication technology and belongs to its mathematical fundamentals, its real value was far from being immediately recognised. In fact Kotelnikov formulated it during his attempts to find minimal frequency band sufficient for transmission of a message with rigorously limited frequency spectrum through a communication channel. However his report, “On Conductivity of “Ether” and Wire”, published in the proceedings, “Materials on Radio-communications of the 1 st All-Union Conference on the Problems of Communication Systems Technical Reconstruction” (1933), was printed in a limited number of copies in the USSR and has remained largely unknown in the West. Kotelnikov's following attempt to publish it in the popular Soviet scientific and engineering journal “Elektrichestvo” (electricity) was a failure. As the negative editorial answer read that the article was not interesting for the broad engineering audience and the editor's portfolio was overfilled he did not publicly write on the subject any more for rather long time. Thus the theorem became really famous only after series of publications made by C. E. Shannon already after the war, in 1948. C .E. Shannon is famous as creator of the theory of information – an important domain of the communication theory. However, Shannon himself cited earlier publications. One should also notice that as early as in the beginning of the 20 th century, the English mathematicians E.T. Whittaker and J.M. Whittaker discovered this theorem as a partial result of the function interpolation theory. Nevertheless the sampling theorem is traditionally associated with names of Kotelnikov and Shannon, therefore it's referred to as “Kotelnikov-Shannon” or “Shannon-Kotelnikov” theorem (although sometimes “Whittaker-Kotelnikov-Shannon” theorem). 3. Kotelnikov's theory of potential noise immunity. Kotelnikov's theory of potential noise immunity has become another superlative scientific achievement, which played key role in the development of communication systems. It was created by the end of 1946. Practical implementation of this theory made possible optimal synthesis of the devices intended for signal receiving and processing in various conditions and for various purposes by means of preliminary theoretical calculations. It also permits to calculate in advance qualitative characteristics of their operation. Same as it the case with the sampling theorem essential contribution to development of this theory was also made by several British and American scientists: A. Sigert, D. Middleton, P. Woodworth and I. Davis, who independently came to analogical ideas some later in time, but did much for their development and popularisation. Gottfried Wilhelm von Leibniz used to say that, “to know the method how the discovery has been made is often more important than the discovery itself”. Many years long he worked on creation of the theory that would permit everybody to make inventions, unfortunately with not much success. Kotelnikov and others have had more luck, in the electrical communications domain, due to their theory of potential noise immunity . In fact, already before Kotelnikov's theory some publications appeared which displayed analysis of the noise immunity in reception of signals. The analysis was performed with the use of special receivers equipped with filters and detectors of signals with preliminarily defined parameters. V.A. Kotelnikov was always interested in fundamental theoretical problems. Thus, creation of his theory he began with investigation of possible noise immunity limit, which could be reached during receiving of signal accompanied with noise in the communication channel. In his doctoral dissertation Kotelnikov succeeded at finding optimal algorithm of the received signal processing. The solution was based on initially known form of the transmitted signal and statistical characteristics of the affecting reception noises. With this he solved principally new problem from the optimal receiver synthesis theory. Eventually he worked out complex of methods for proving the noise immunity of the optimal receiver. However V.A. Kotelnikov did not cite or make references to any previous publications in his thesis, for the simple reason that nothing had been done before him in that field. Neither had he demonstrated a drawing or a diagram of any concrete receiving device. Such seemingly “featureless”, or rather “imageless”, style caused underestimation of the new theory even among the prominent experts. The impression of its being too abstract and “inapplicable” was also increased by absence of proposals on new methods of signal transmission and reception. Even more, Kotelnikov discovered that, according to his theory, some traditional methods more or less meet the requirements of the potential noise immunity. Nevertheless he himself was well aware of the importance of his theory. He mentioned in introduction to the dissertation that the potential noise immunity would make possible analysis and subsequent choice of optimal ways of transmission what would greatly increase quality of radio signals reception and receivers. Kotelnikov's theory was based on methods of the probability theory and well “facilitated” with its formulae. As the latter was a very new issue for the engineering audience of that time it essentially deterred practical implementation of his conclusions. Besides, at the first years it was accessible only for narrow circle of those who had had a chance to read a manuscript of his dissertation thesis. The article, “Problems of the Noise Immunity”, which was published in the “Book of Radio-technical Issues” (1947) presented only a brief abstract of his dissertation. As Kotelnikov himself wasn't publishing his results during almost ten years one could conclude that his discovery was by and large unnoticed in that period. Finally his dissertation was published in 1956, after appearance of numerous foreign publications on the same subject and their subsequent translation into Russian language. Such delay naturally reduced possible efficiency of his work. The dissertation thesis itself included several chapters. The first one was focused on mathematical foundations of the theory: signals, noises and their Gauss distributions were represented with Fourier's series. The second was dedicated to the theory of the discrete signals optimal reception. Also fundamentals of the synthesis, intended for optimal algorithm of the received signal processing, were described. The algorithm was based of the Bayes formula, which a-posteriori demonstrated probability of the signal reception. The synthesis of the optimal receiver consisted in practical realisation of the signal processing algorithm with the use of radio-components. The algorithm formed, for each of the possible effective signals, corresponding output signals with voltages proportional to values of a-posteriori probability of receiving. The receiver selected maximal of the voltages and thus “made a conclusion”, what signal had been transmitted. Kotelnikov also demonstrated how the noise immunity at the reception of signals could be defined by calculation of probability of erroneous receiving. orthogonal multi-positional and composed signals. Kotelnikov also studied reception of signals under normal fluctuating noise with intensity dependable on frequency. Besides optimal signal reception he also studied reception with usage of synchronous and common detectors. Those experiments demonstrated that differences between common and optimal reception methods are minimal. The third chapter presented theory of optimal evaluation of the parameters of signals (such as amplitude, frequency and phase). That theory provided basis for synthesis of optimal devices intended for reception of analogue signals with various forms of modulation. New theory was also implemented for estimation of the signals parameters precision under various forms of modulation. The obtained precision values corresponded with precision of evaluations in traditional receiving devices. Generally speaking Kotelnikov studied noise immunity of all modulation methods which were in use at those times. Those were amplitude, frequency and time-pulse modulation. He demonstrated that all non-linear modulation methods were characterised with threshold phenomena at reception of low signal and worked out methods for the threshold characteristics evaluation. Implementation of the multi-dimensional space notion for visualising of the obtained results was undoubtedly progressive feature of the research. So he established principally new creative approach to development of progressive radio-systems. His theory formed scientific basis of a new scientific field, essentially changed way of thinking of many engineers and introduced such principal notions as optimal reception system and potential noise immunity . It also made possible for every specialist first to define structural diagram of some optimal receiver and thus to create optimised devices in practice. However, as it has been mentioned before, Kotelnikov himself did not present any executive instruction, useful for practical engineers. Nevertheless, despite rather small volume, just 150 pages, his book, “Theory of Potential Noise Immunity” was full of principal ideas which were later developed by numerous scientists, who worked in that field decades long. Its English translation appeared in the USA in 1959. Recognised priority of V.A. Kotelnikov in creation of the signal optimal reception theory, in implementation of the multi-dimensional geometry for interpretation of the problems of noise affected signal reception and in researches of non-linear signal filtration with background of noise with non-uniform spectrum was also referred to in its introduction written by professor N.M. Abramson of the Stanford University . In his research V.A. Kotelnikov did not demonstrate connection of the potential noise immunity theory with mathematical theory of statistical solutions, fundamentals of which were formed already in the 1920-1940-s by R. Fisher, J. von Neumann, E. Pierson and A. Wald. However he himself “re-discovered” most of its statements in applied form concerning the noise affected signal reception problems. — theory of the multi-positional signals reception. These theories were developed by numerous scientists both in the USSR and abroad. Those were L.M. Fink, V.S. Melnikov, D.D. Klovskiy and many others. At the same time E.I. Kulikov, S.E. Falkovich, L.A. Vainshtein and others were working on the theory of signal parameters evaluation and optimal reception of the analogue signals. It was also developed by some American scientists. Importance of this theory, which demonstrates fundamental statistical principles of the information transmission via communication channels, is undisputable and the explosive character of the electric communication technologies of our time is the best proof of that. However, as it has been mentioned by the famous French physicist Louis de Bruel, “Each new success in our cognition raises more problems then solves”. So it's only natural, that work in this field is still in progress. By the end of the 1950-s, the books displaying basic statements of the signal reception theory begin to appear. In 1958, I.N. Amiantov, a professor of the Moscow Air-Force Engineering Academy has written and published one of the world' first monographs. From the beginning of the 1960-s, a new obligatory subject was introduced in curriculum of the universities, which prepared specialists on the signal transmission, reception and processing. It was named “Signal Transmission through Communication Channels”, and was based on Kotelnikov's theory and information theory of C. Shannon. 1. The consonant “l” in the family-name Kotelnikov [k o t e l' n i k o v] should be pronounced softly, in a way more typical for the German language. 2.Original Russian biography of V.A. Kotelnikov by M.A. Bykhovskiy (“Virtual Computer Museum”, www.computer-museum.ru) has been revised, extended and translated into English language by A.Y. Nitusov. Some materials have been added from other sources . 7. vocoder (device) – abbr. of “voice encoder”. 8. SIGSALY – just a meaningless name given only for secrecy reasons. 13. The USSR highest premium. 14. Published in journal „Radio-engineering and Electronics“ (№ 3, 1959). 16. The USSR highest civil order. 17. A.S. Popov –scientist of the St Petersburg marine academy, inventor of the world's first radio-transmitter (1895). 19. As the, originally English, quotation was re-translated into English from Russian variant, it inevitably must have some differences from the original text (A.N.). 20. COSPAR international non-governmental scientific association/ committee for the space research partnership (more on CASPAR: http://cosparhq.cnes.fr/ ). 22. «When these references are reviewed, one can state with certainty today that the Russian scientist Vladimir A. Kotelnikov in 1933 was the first to formulate in a mathematically exact manner and publish the sampling theorem within the context of problems in communication technology” (from commentary on Kotelnikov's premium of the Eduard Rhein foundation (Germany), by Prof. Dr. Hans Dieter Luke, RWTH Aachen). (Given example with CD sampling originates from the same source). However, it's not clear if Shannon could have any sufficient information about Kotelnikov's earlier work. 24.Original Russian title, „Radiotekhnicheskiy Sbornik“, it was published by „Gosenergoizdat“ in 1947. (The present revised translation is chiefly based on Russian article - part of the “Virtual Computer Museum” – www.computer-museum.ru. The article was placed in the Museum with permission of the editorial board of journal “Elektrosvyas'”, where it had been originally published. “Elektrosvyas'”, N 9 (2003), p.43). A.L. Zinovyev. “My teacher Kotelnikov”. Radiotechnicheskie Tetradi , N7 OKB MEI (1995). L.I. Filippov. “Our Gold Pedagogical Crown”. Radiotechnicheskie Tetradi , N7 OKB MEI (1995). A.F. Bogomolov, K.A. Pobedonostsev. “Contribution of the Special Design Bureau of the Moscow Power-Engineering Institute to Development of the National Rocket and Space Radio-Electronics” (on the 90 th anniversary of his birth). Radiotekhnika , N8, (1998). A.V. Sokolov, L.I. Filippov. “Theory of Potential Noise Immunity as Basis for Statistical Radio-engineering”, Radiotekhnika , N8, (1998). N.N. Andreev, A.N. Peterson, K.V. Pryanishnikov, A.V. Starovoitov. “Founder of the National Encripted Telephone Communications”. Radiotekhnika , N8, (1998).